Life is inferring with play. I am not able to continue this blog. I have asked the Canoe Cruisers Association to take over the Facebook page and post events having to do with with family canoeing or kayaking. So check Facebook. I am keeping this blog online because this blog had over 28,000 views in 2016, so obviously there are people getting information from it. 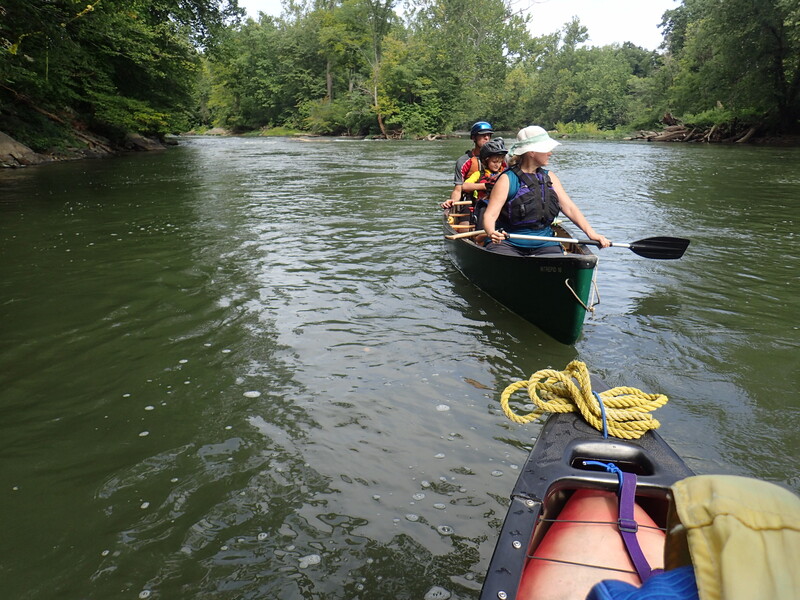 The Canoe Cruisers Association has offered a practiced novice paddling trip on the GW Canal of the Potomac River every Sunday in August and into September. I contacted a couple of families to see if they wanted to do it and we settled on Sunday of Labor Day weekend. 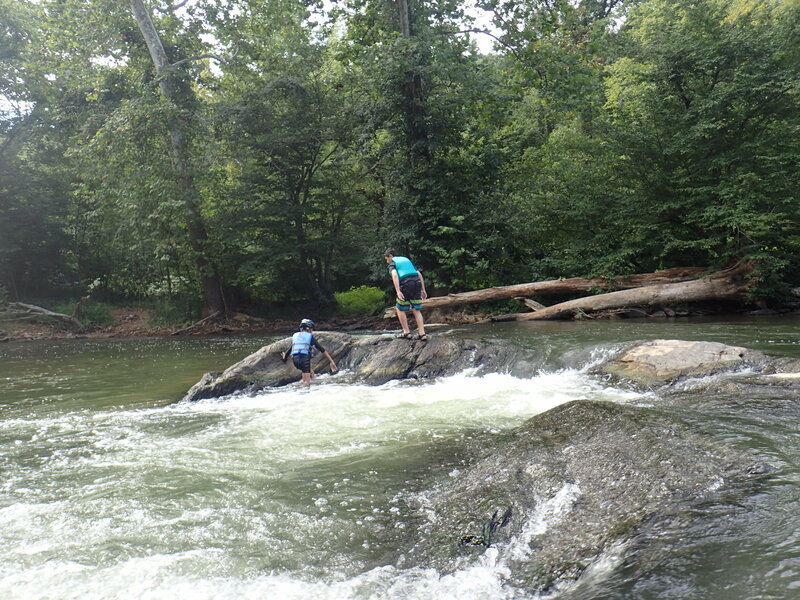 This is a fairly easy class 1 -2 whitewater trip, but I didn’t want to take two other families with not so much experience down this section of the river by myself. I wanted more experienced backup and that is what is great about the CCA trips. There were several experienced paddlers who helped our group down this section. Barb Brown gave paddling instruction to Phil and his older son, Dustin, who were going on their first whitewater canoe trip together. 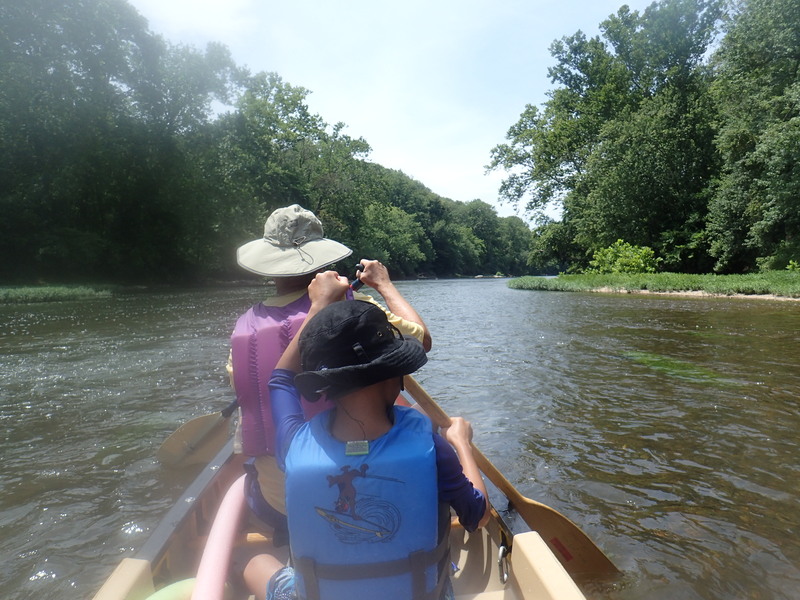 We took Phil’s younger son, Thomas, in our canoe along with our kid, so that it would be easier for Phil and his older son to paddle without having a passenger. Alf Cooley and Tim Tilson helped rescue our other family when their boat went over in one of the rapids. Just this extra experience with new paddlers is what is really great about these CCA trips. This is not a trip I feel comfortable leading since it is not a straight-forward trip. You have to intimately know the route. 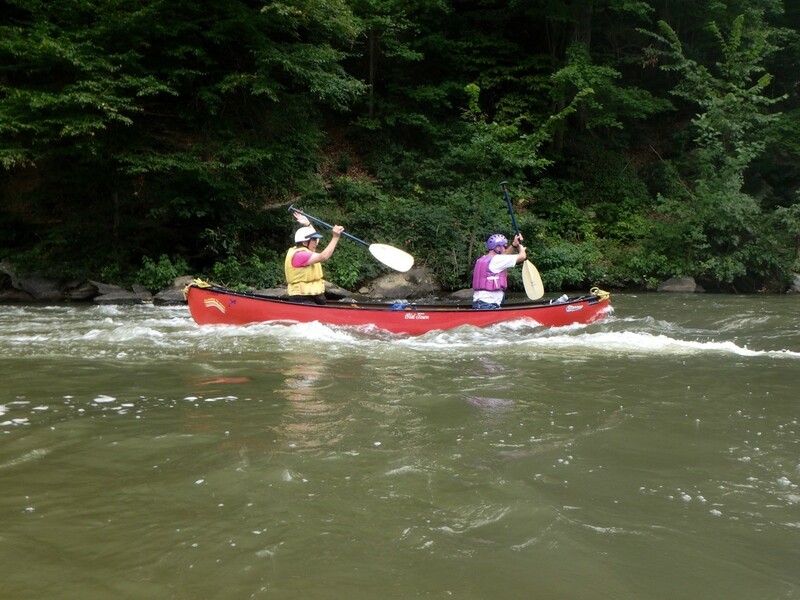 This is a trip you can run without shuttles, as you can paddle down the GW Canal (Potomac River – Virginia side) and then paddle up the C&O Canal (Maryland side). I have always run this as a loop with no shuttles. But luckily our trusted leaders realized with all the Hydrilla in the C&O Canal, this would be a better run if we ran shuttles. This trip begins at Violette’s Lock. Alf set up a shuttle with cars left downstream at Pennyfield Lock, before we even got there. So for some people the trip began at Pennyfield Lock. The paddle starts on the Maryland side of the Potomac River. You put in above Seneca Breaks and paddle all the way across the Potomac River to the Virginia Side. Aim for the American Flag at the Trump Golf Course. 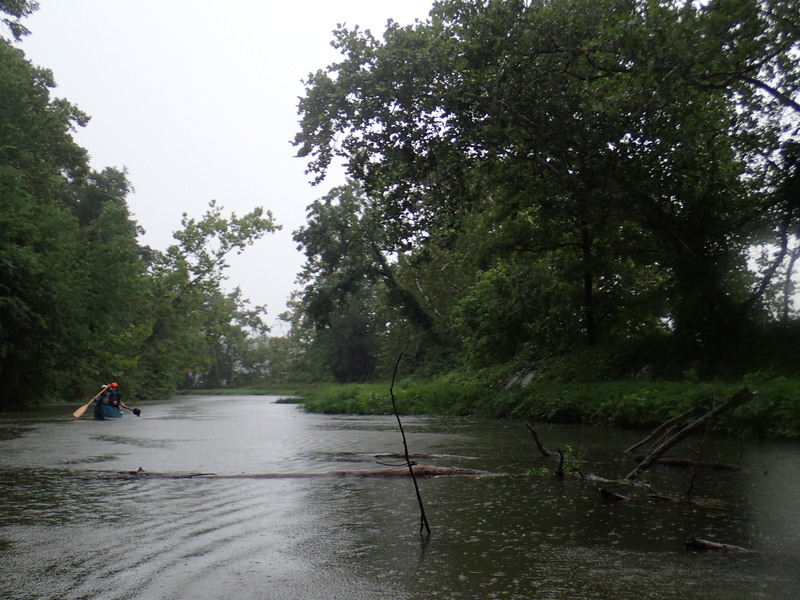 Once you get over to the Virginia side, you find the George Washington Canal, which was dug out in 1785. You can read about the Patomack Canal in this wiki article. The place where we paddled is referred to as Seneca Falls. What I know as the GW Canal is sectioned off of the main Potomac River and provides for a nice small river experience on a very wide river. American Whitewater writes about this route. If you don’t know the route, find someone who knows it and can take you. Or go on a club trip. It is not hard to find the beginning of the channel, but what is hard is knowing where to exit the channel and where to take out. The exit of the channel is around some islands and if you miss it, you miss it. You still have to paddle all the way across the Potomac River to get to the take out on the Maryland shore. If you are running it without a shuttle then the paddle down the river to the takeout point to transfer to the C&O canal is not far. 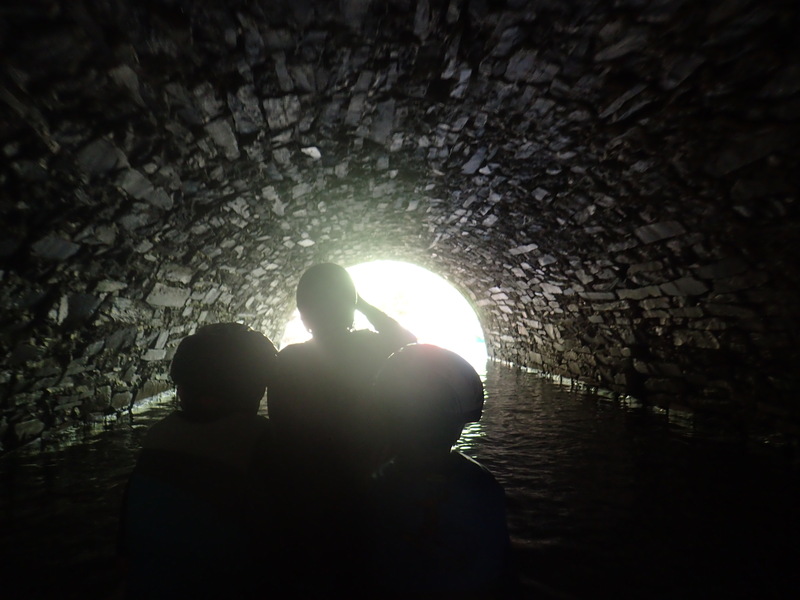 If you ran a shuttle to Pennyfield lock, then the takeout is further and you go in an inlet on the Maryland shore and then under the C&O canal through a tunnel into the parking lot at Pennyfield Lock. Our group was pretty big, lots of kayaks who played in one of the rapids while we fed the kids who seemed to be hungry all the time. We had several experienced paddlers with us which is nice for safety reasons. 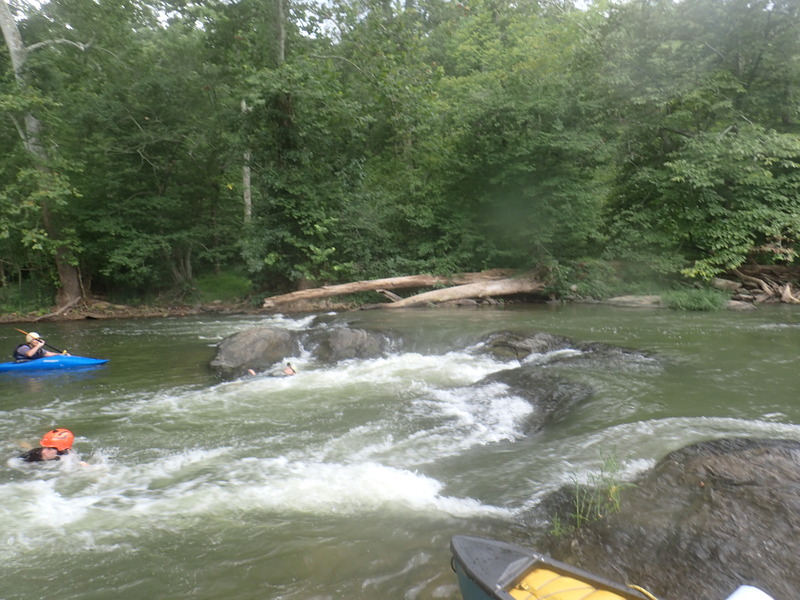 One of our canoes went over in one of the rapids. We helped retrieve the canoe and help the paddlers back in the boat, but the children in the boat got wet and ended up being a bit cold. This paddle started at 9:30 am, and we were all finished by 1:00 pm, but the warmth of the day was not until later in the day. Even in the summer, it is good to remember to bring extra and warm clothes for the children to change into if they get wet and it is too cold for them. Our child was in a wetsuit, but even that wasn’t enough to keep him warm after taking a little swim (on purpose) in Jacuzzi Rapids. CCA organized this trip for anyone, but I think if they were ever to organize a paddle with families in mind, I would do it later in the day so that it would be at peak warmth while we are paddling. Kids just get colder than most of the adults. You will notice that all the kayakers (required) and some of the canoeists have helmets on. Paddlers wear helmets in the rapids to prevent head injury in case of falling on to a rock. In a kayak, rolling without a helmet could cause head injury. We had paddling helmets and our child and friend wore bike helmets. But it was mild enough that you could get by without a helmet if you were in a canoe. I found families interested in canoeing, but most everyone did not own a boat and wanted to paddle at a place to rent boats. But it is hard to coordinate with families and even harder to coordinate with families who do not own boats. The best places to paddle, they don’t rent boats! If you want to become a canoeist or kayaker, then it takes some equipment to do it. There is a big initial investment, but after that, the investment is very little, as it is free to paddle on rivers. You just need to drive there and go with other folks, who you meet on the river or join a paddling club. Paddlers are a great bunch of people and love to talk about the sport and help new paddlers in the sport. Half of my interest in paddling was because the people were so nice and it was fun to go do something enjoyable in the outdoors. If you are interested in canoeing or kayaking, the only way to really do it is to buy a boat. Buy used, but get a boat. Fall is a perfect time for buying a canoe. Outfitters sell their stock in the fall used. Equipment tends to be cheaper in the fall, more expensive in the spring. A canoe is a good place to start, because you can carry passengers and small children don’t want to paddle anyway. As children get bigger, then you can add to your investment and buy another canoe or buy a kayak or two. You should be able to get some of this stuff used: the canoe, paddles, and left vests. Use craigslist, go to Value Village etc. Buy from outfitters. You probably are not going to be able to get the dry bag or straps used (You don’t want to buy a used dry bag.). You might be able to get foam for the car or roof racks used. Start looking now, so you are all set for next spring. Downriver Canoe Company has some used stuff, just call. Craigslist – people sell boats all year around, and especially in the fall. I think every Labor Day sale, REI offers 20% off Yakima and Thule Racks. Maybe more than once a year. If you are a member of REI, they send you a coupon to buy something at 20% off at least once a year. This year is was around Memorial Day. In the spring Costco sells new life vests at a good price. Sierra Trading Post has some good deals on dry bags now. You can get a large bag for $17. Do not buy a canoe with lots of rocker unless you plan on doing exclusively whitewater. I see people selling whitewater boats on craigslist without actually telling the buyer it is a whitewater boat. Mohawk XL15 is a tandem whitewater boat. It has lots of rocker. Rocker explained. Moderate rocker is OK, extreme rocker, is only good for whitewater. Another idea is to buy a canoe trailer. I know this sounds like I’m talking about a big trailer, but I’m not. I must say I peruse craigslist all the time looking to see what canoes people are selling. But one thing I’ve seen this summer were 2 or 3 people who were selling canoes and a canoe trailer together. The trailer is for a single canoe. Usually they are selling the two together and they were reasonably priced. I don’t remember the price, but I thought this was a great idea. Of course you would need to get a hitch on your car, but that is pretty easy at U-Haul. A trailer like this, but people sell them used with a canoe. If you don’t like the canoe, just sell the canoe after you get the set and put your own selected canoe on it. I was just talking with a fellow aging paddler today and mentioned a trailer and a canoe dolly as a way to solve the transportation problem as we age. So why not start out with a trailer and a dolly? So there are ways to enjoy the sport for the not so strong and as we age. But if you want to paddle with your family or friends, then you need to own a boat. After you have learned how to paddle flat water, for some the next step is to learn how to paddle whitewater. Others are not interested in whitewater, which is fine too. The first course I took with the CCA (Canoe Cruisers Association) was a tandem whitewater course many many years ago with a former boyfriend. Although I have spent most of the whitewater paddling in a kayak, I started in a canoe and have flirted with canoeing over the years. I’ve always wanted to be at least an acceptable canoeist. The second time I took the whitewater canoe class was in a solo canoe; the third time I took it was with my husband and our newly purchased tandem canoe (about 13 years ago) and then my husband and I took it again, since we haven’t done much whitewater paddling since we adopted our child. And neither of us is really good in a whitewater canoe. We have a lot to learn. Brendan Fitzpatrick was our ACA (American Canoe Association) CCA instructor and Barb Brown was our safety boater. There were eight students in four boats. Brendan was in a solo whitewater canoe and Barb was in a whitewater kayak. Some of the students had been whitewater paddling before but took it to increase our skills. 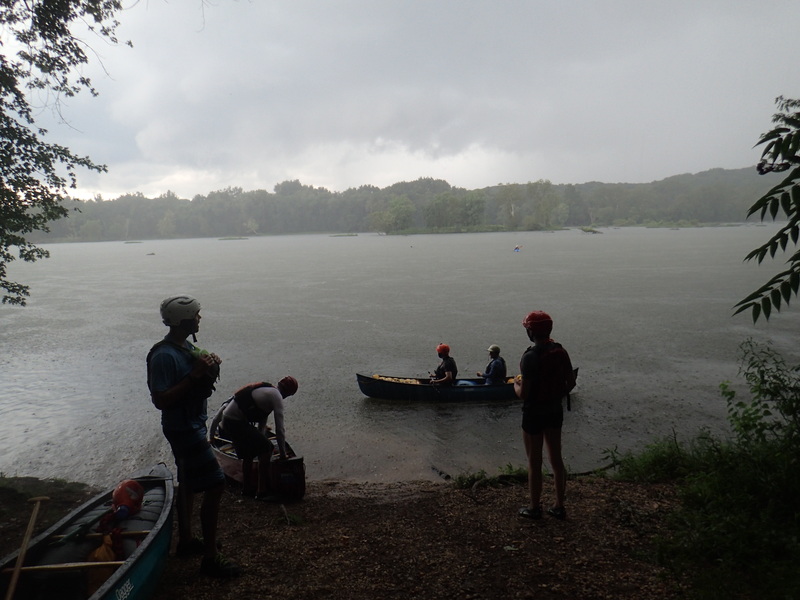 Some students were new to whitewater paddling. 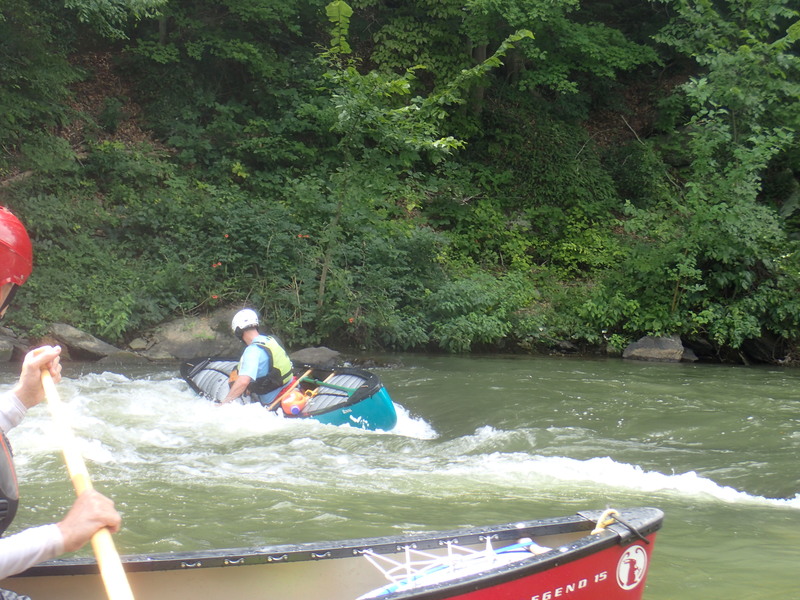 At least one is a whitewater kayaker branching out to learn new skills in a canoe vs. a kayak. To qualify to take this class, you have to already have completed the flat water canoeing class which was offered earlier this summer or have those skills. And of course you need to be a competent swimmer. Not all of the students owned boats. Brendan supplied a couple of boats for students to use. This was a six hour, one-day course. So Brendan could not cover everything you need to know in one day. 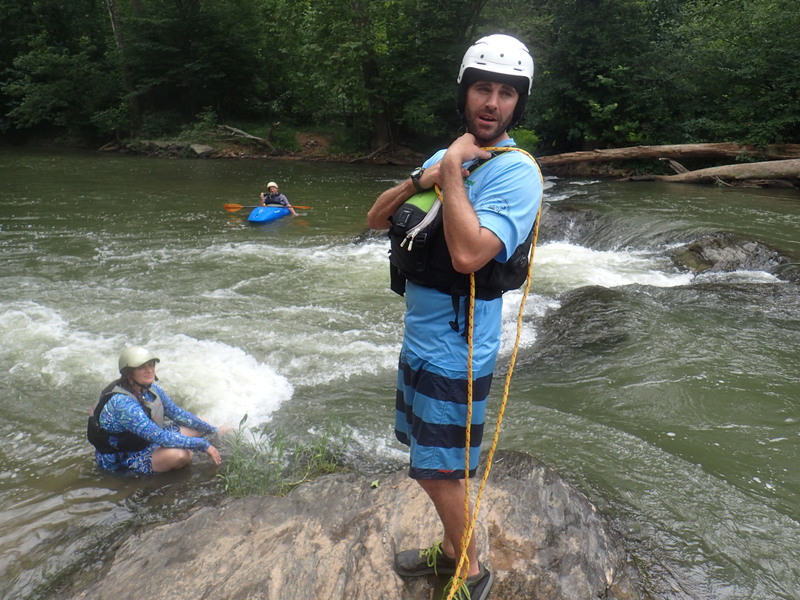 When I first took the CCA whitewater course, a lifetime ago, it was a 3.5 day course. A Friday evening, all day the first Saturday. Then the next weekend it was all day Saturday and on Sunday there was an all day trip to a different river. Brendan covered equipment, safety, parts of the boat, the basic strokes. Then on the river we worked on low and high braces. We changed places in the boat several times throughout the day. So the bow paddler (front) paddled in the stern (back) and vice versa. In the water we practiced mainly eddy turns, ferrying and peeling out. The paddle strokes used in these skills are: pry, draw, cross-bow draw, sweep and forward stroke. These skills are also used in whitewater kayaking, but I can attest that it is more difficult to do these skills in a tandem whitewater canoe. In a kayak, you don’t have anyone to communicate with and you paddle from the fulcrum (pivot point) of the kayak. In a tandem canoe, the fulcrum is still the middle of the boat, but you are sitting either in front of or behind the fulcrum and what stroke you do depends on what position you are sitting in. One thing that we couldn’t get into in a one-day course was river reading. If you are interested in whitewater canoeing and you might be interested in taking a week-long course in it. Madawaska Kanu Centre, in Barry’s Bay, Ontario, Canada is one place where you can take a 5-day course in whitewater canoeing. There are many places you can take a multi-day course in kayaking, but canoe instruction is harder to find. I took a 5-day course in whitewater kayaking many years ago at Madawaska and since we paid in Canadian Dollars, that year everything was 30% off! Even earlier in my kayaking career, I took a whitewater kayak course at Nantahala Outdoor Center in Bryson City, NC. Everything I have learned about whitewater canoeing, I’ve learned from CCA or MCC (Monocacy Canoe Club) classes locally. 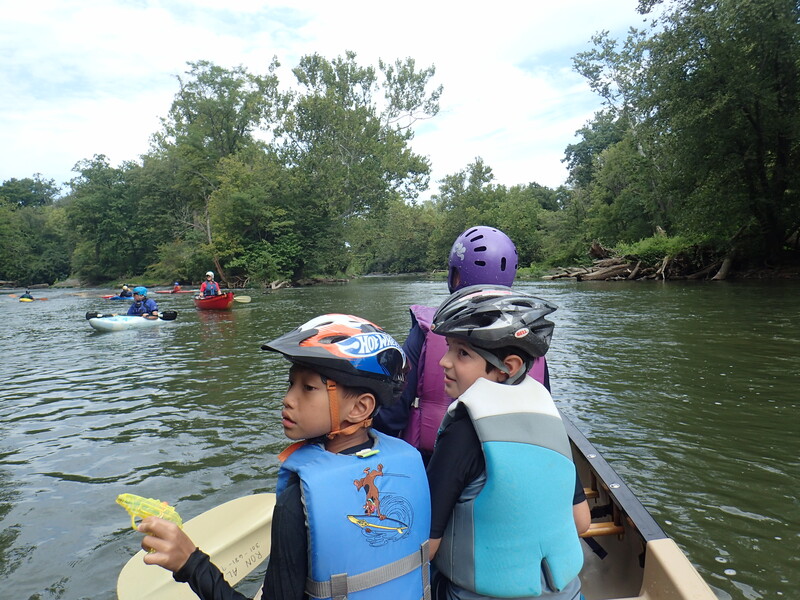 But river reading and safety skills translate from kayaking to canoeing. One thing that is essential if you plan to practice whitewater boating is taking a swiftwater rescue course and a first aid course. I think I’ve taken a swiftwater rescue course three times in my life, and it is probably time to take one again. I know both CCA and MCC offer swiftwater rescue courses every year. And First Aid and CPR training is available from the Red Cross, year round. 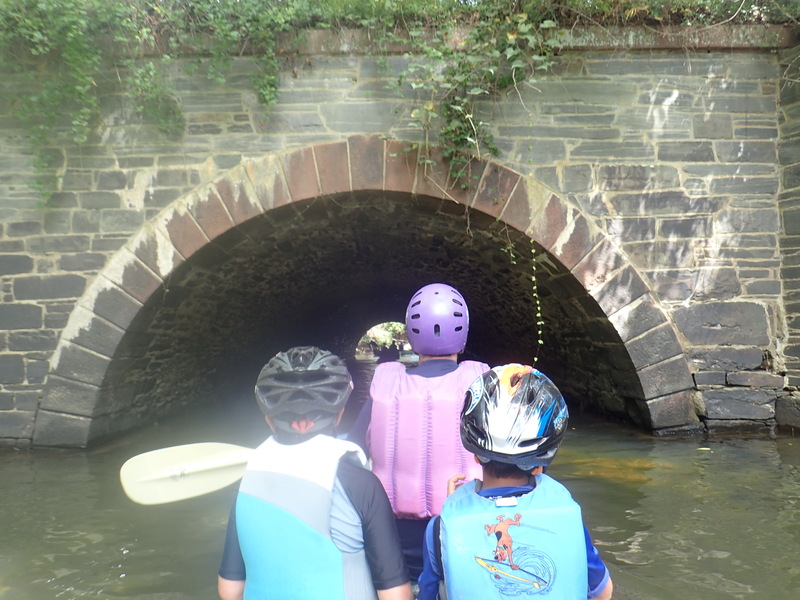 Did you come to the Introduction to Paddling at Riley’s Lock? Now what? Where can you learn more and gain more skills? 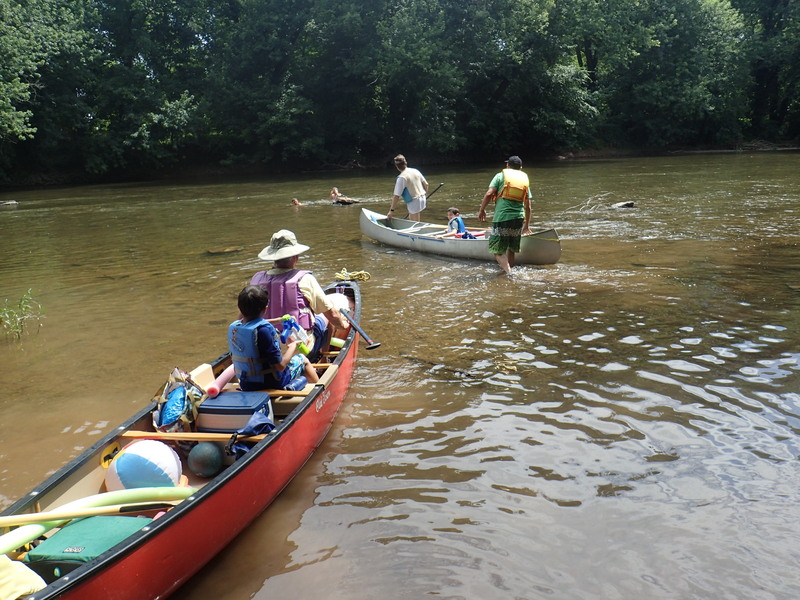 One hundred and sixty-five people signed waivers for the July 10 Family paddle and there were more who showed up with their own boats or borrowed boats. 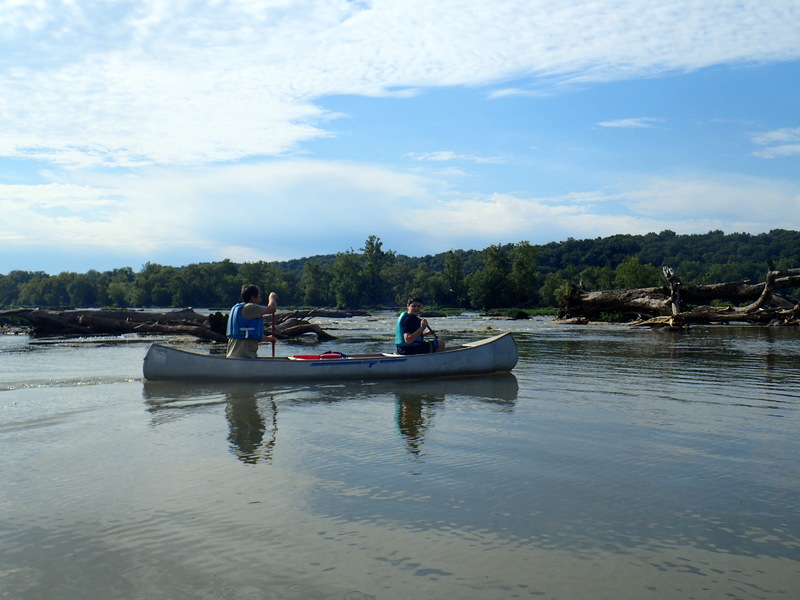 Calleva offers kayak lessons for children and adults right at Riley’s Lock. 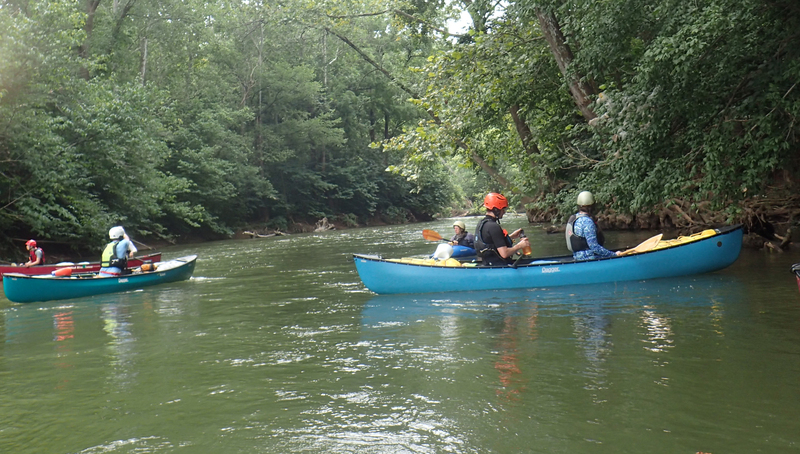 Both Calleva and Valley Mill Camp offer paddling during summer camps for children. If you google “kayak lessons on the Potomac River” or “canoe lessons on the Potomac River“, you will get other companies who can teach you some skills. Some are local and some are up near Harper’s Ferry, WV. 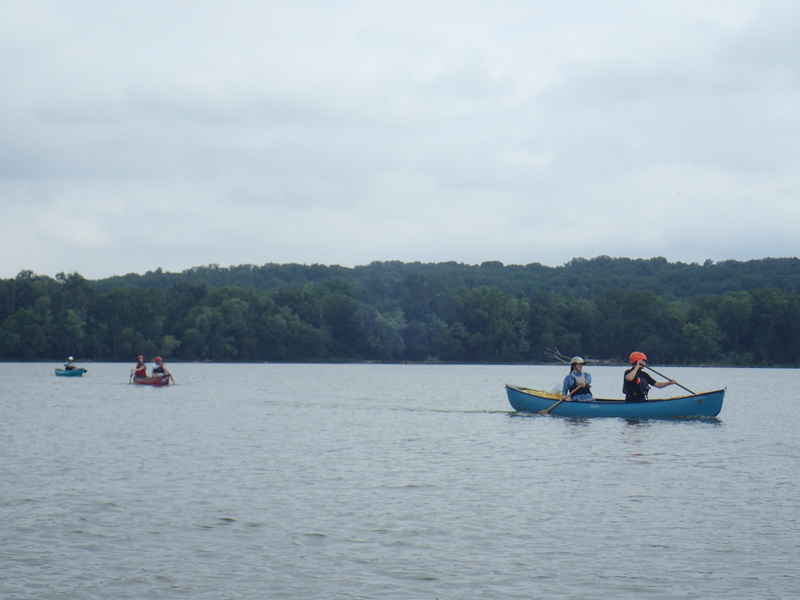 I’ve seen Prince Georges County Recreation offer canoe and kayak lessons on Lake Artemesia in the Spring. Some of the companies are just whitewater, so if you are just interested in flat water paddling, make sure you select the right company. On July 30th, the Canoe Cruisers Association is offering a class “Canoeing Basics for Rivers and Lakes“. This is a very affordable one-day class at Riley’s Lock taught by an ACA (American Canoe Association) instructor. This class is for adults and possibly teens who are especially interested in taking this 6 hour class. 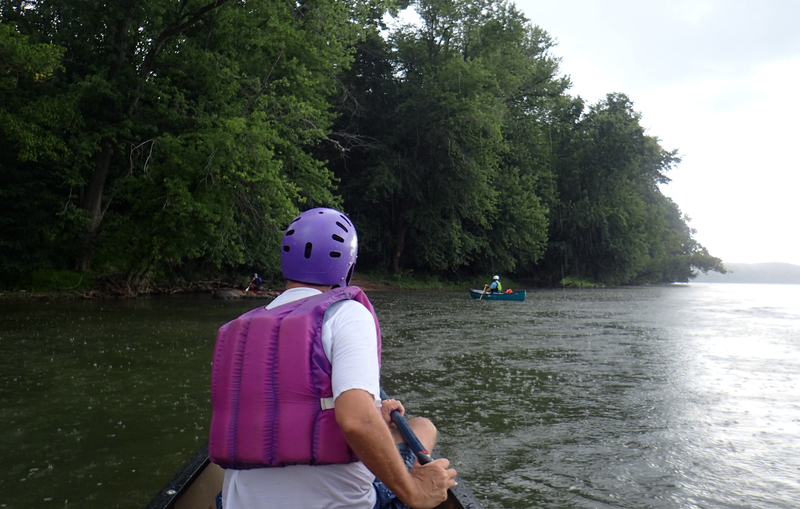 If you are already a skilled flat water canoeist, the CCA is offering Whitewater Canoeing on August 21, 2016. I did meet many people on Sunday who didn’t want any tips or instruction in paddling, but just by looking at them, it was clear they didn’t know what they were doing. Taking lessons not only helps you enjoy the sport more, but lessons always have a safety component that will help you be a safer paddler. And especially if you are paddling with children, then you really want to be a safe paddler and not depend on things always going right. One thing that I haven’t mentioned but is a no brainer. You need to be a good swimmer to be a safe paddler. So make sure your swimming skills are good as well as your children’s. Once you own a boat, joining a club, like the Canoe Cruisers Association is a good way to meet other paddlers and learn more from other members. The second thing I bought was racks for my car, so I could carry a boat. Many cars come with racks so you might already have some or you might have to buy a whole new set. I was lucky in that I started paddling when cars had gutters on them, and everyone had Quick and Easy roof racks that you bought and screwed into 2 x 4 pieces of lumber. Now buying a roof rack is pretty expensive. Thule and Yakima make good options. Most paddlers add Thule or Yakima crossbars to their already installed car racks so they can get wider crossbars and also install other components. If you are interested in Canoeing or Kayaking, then buying life vests and roof racks is a start. 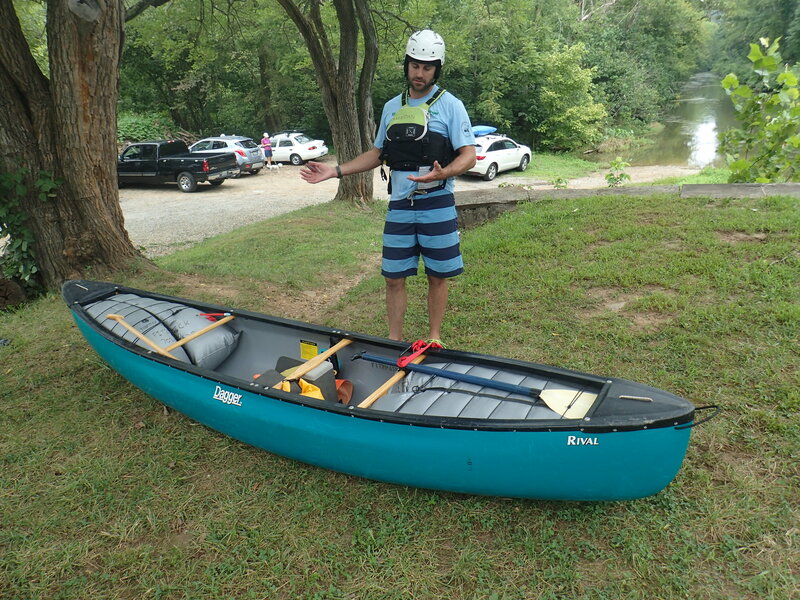 There are places to rent canoes and kayaks around the DC area, or further outside of the immediate area, but after a while you will want to get your own boat (or boats) and go to more interesting places which don’t have rental boats. Here are links to help you buy used canoes. Free Event: They supply the boats, you supply the energy! 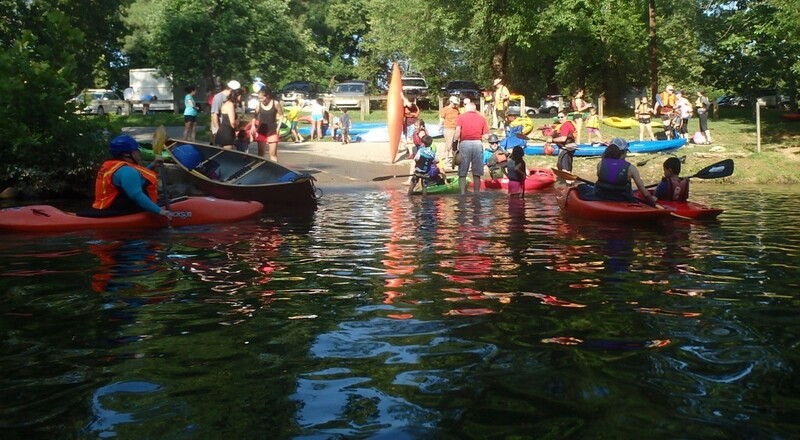 As part of the Potomac River Festival, there will be a Family Paddling Event on Sunday afternoon. 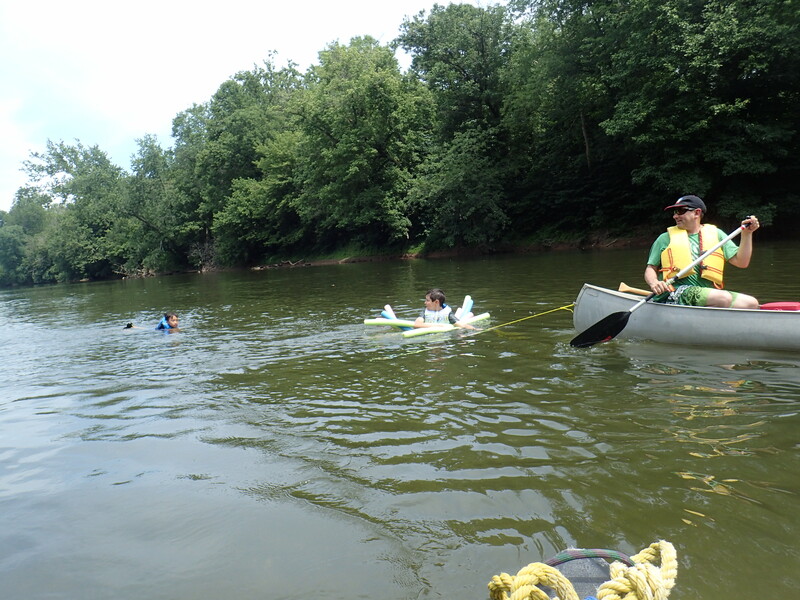 Calleva supplies the boats, basic paddling instruction will be provided, and you supply the family! From the Beltway, take River Road west toward Potomac. Continue past Potomac for 5 miles. Turn left to stay on River Road at the intersection with Seneca Road, then left on Riley’s Lock Road. Who is the event designed for? Adults and kids, age 5 and over, are welcome to join the fun. No experience is necessary. Plan to get wet and have a blast! Bring a Ziploc bag for your keys if they can’t get wet. The event is free! There are sponsors to defray the costs! What Type of Boats will Be Available? The Potomac River Festival has been going on for a good many years. The main part of the event is the Great Falls Race. Expert kayakers and canoeists from around the nation compete in a race down Great Falls. There is also an upriver race and other events. 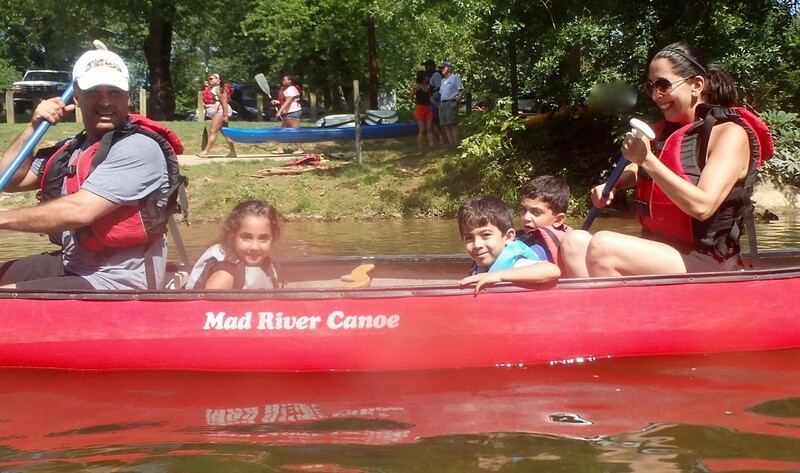 But the Family Introduction to Paddling part of the Potomac River Festival started last year and is a more sedate, family oriented event to introduce novices to the sport of kayaking and canoeing. 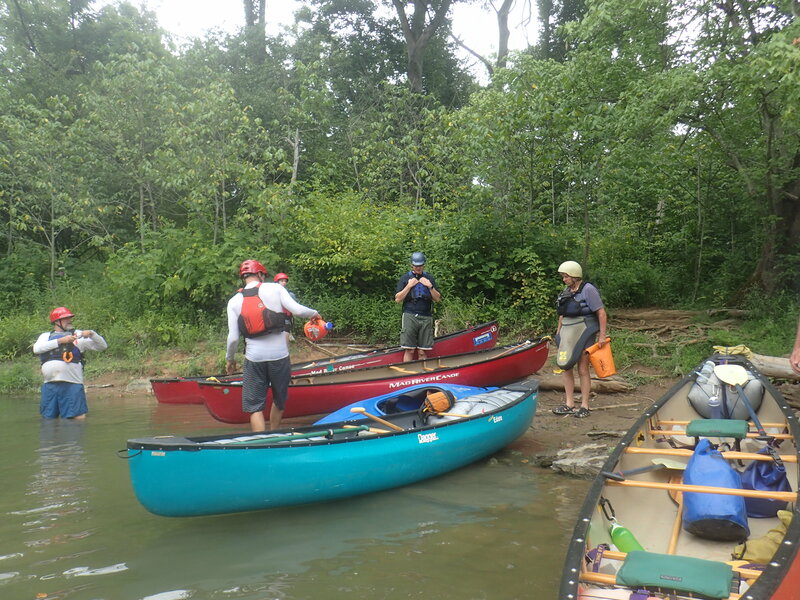 Here are some pictures from the 2015 Family Paddling Event.